French Emblems: Emblem: Aemulatio impar. Contre un emulateur mais non approchant. Et praedae partem saepe cadentis habet. Praeteritásque avidus devorat ore dapes. Utitur hoc lippo curia tanquam oculo. An ignoble kite accompanies the soaring hawk and often gets a piece of the prey as it falls. The sargus follows the mudfish and greedily devours the food that it scorns and passes by. Oenocrates behaves like this with me - but the lecture-hall I’ve abandoned treats him like a runny eye. Comme d’un plus habile homme. baillant un nom de maistre Biberon, ou Boyvin. 1. 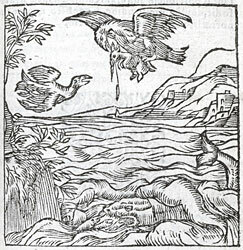 For the association of the kite and the hawk see Aristotle, Historia animalium, 9.1.609. 2. For the sargus see Emblem 75 ([FALc075]). For its habit of following the lutarius (the mudfish) and eating the food it disturbs as it burrows in the mud, see Pliny, Natural History, 9.30.65; Erasmus, Parabolae, p. 253. 3. lippo...tamquam oculo, ‘like a runny eye’, a proverbial expression. See Erasmus, Adagia, 4100 (Lippo oculo similis): a runny eye is something you would prefer to be rid of, but while you have it you cannot leave it alone; similarly there are people you do not like, but you find yourself obliged to make use of them. 4. Corrected from the Errata.